For the most part, keylogger software are considered as security and privacy threats. They are unwanted in most computer systems. Their presence can spell such problems as stolen passwords and unauthorized reading of messages. Nevertheless, they are not entirely useless and unwanted. Depending on their use, they can also provide solutions. Similar to the software described below, there are many keyloggers that can be used for legitimate purposes such as criminal investigations and entrapment operations. Ardamax Keylogger is an easy-to-use monitoring software that features a notably helpful “quick tour” page. It comprehensively captures activities on a computer including information about the applications used, titles of the windows launched, name of user, date and time. The logs produced can be quite lengthy to be properly reviewed. 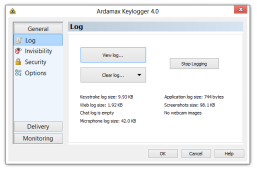 Fortunately, the Ardamax Keylogger includes log filters to quickly sort out what can be considered as useful. The main disadvantage of this software is its lack of a stealth mode. 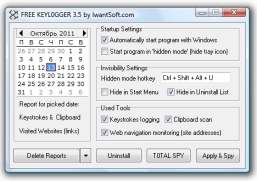 Completely free to use, Super Free Keylogger is a very light program for the Windows platform. It is designed to run covertly and capture all keystrokes made in the computer being monitored. It is also capable of capturing screenshots at specified time intervals or when new applications are launched. The screenshots could be an image of the full screen, only the active window, or both. Super Free Keylogger can be set to send logs to a user-specified email address. The Best Keylogger is not really the best keylogger software there is but it is certainly not the exact opposite of its name. It is a capable keylogger that records almost everything that takes place in a computer. It can even record non-English characters and conversations. It also captures screenshots and reveals passwords and Internet browsing history. The implied primary purpose of the software is to track activities in a computer while the computer’s owner is away. It is a helpful tool for schools or business organizations that want to know how properly their computer resources are being utilized. The Best Keylogger also supports automatic FTP uploads. Argos Monitoring is designed to be an advanced PC monitoring solution. It is available with a seven-day free trial. The software offers secure and unnoticeable monitoring (does not show in the task manager), keystroke logging, internet history logs, screenshot grabbing, advanced recorded data playback, and filters and a search facility for recorded data. It features a user-friendly control panel and intuitive method of configuration and setup. Argos Monitoring can be used as a parental monitoring tool. Developed by Employee Monitoring, Micro Keylogger is a monitoring software that runs undetected in the background. It is designed for 32-bit and 64-bit Windows systems. The software effectively spies on all the activities of computer users. It can be set to automatically transmit the data it obtains via email or FTP. 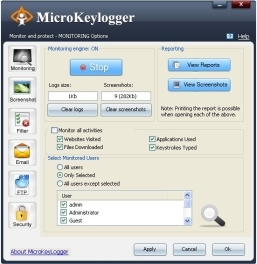 Micro Keylogger records all keystrokes, running programs, user accounts, internet history, and clicked links. It also captures screenshots at user-specified intervals. The software can be used for free within a five-day trial period. The paid full version costs less than $100. 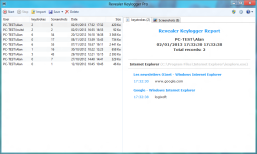 This free keylogger from Logixoft runs on all currently used Windows OS versions. It is designed to record keystrokes (especially passwords, usernames, and IM conversations) and take screenshots that are reported chronologically with accompanying details on file sizes. It is also capable of simple remote monitoring. Data obtained from the computer being monitored may be transmitted through email, LAN, or FTP. Revealer Keylogger claims that its existence in a computer cannot be revealed by the Windows task manager or reflected in the registry. 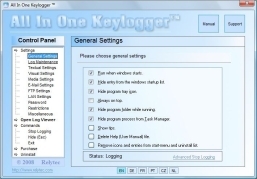 Despites its aesthetically challenged user interface, AllinOne Keylogger proves to be one of the best options for a computer monitoring software. The program requires a master password before running. It claims to be invisible in the taskbar and the task manager. It can run in virtually all the practically usable versions of the Windows operating system, from Windows 98 to Windows 8. One of its outstanding features is its ability to automatically send notifications upon the detection of certain keywords. It is available in a seven-day free trial period. Free Kelyogger by IwantSoft is a keystroke logging software particularly designed to monitor computer activity inconspicuously. It records everything written with the keyboard and monitors clipboard modifications and Internet browsing history. This relatively new program is free to use but is only available for Windows XP, Vista, and 7 computers. Free Keylogger features a small graphical user interface that includes an integrated calendar for the quick viewing of reports. The program can be configured not to be listed in the task manager and start menu. This monitoring software is intended for recording keyboard strokes, chat and email conversations, as well as the programs and contents accessed. The installer is relatively big at 15.33MB that can only be used in Windows XP, Vista, 7 and 8 versions. SoftActivity Keylogger’s set of features includes intuitive configuration panes, discreet running, and the ability to capture screenshots. The size of the screenshots may be adjusted to maximize storage space. Users should be reminded, however, that this software is quite a pain to remove after it has been successfully installed. The program may also be detected as a spyware by most security software solutions. Elite Keylogger lives up to the adjective in its name. Developed by WideStep Security software, it is a powerful monitoring software tool designed for Windows 2000, XP and 7. It is rich in features but it remains to be very intuitive. A password will be asked upon the initial configuration of the software. Some of the features of Elite Keylogger are its calendar, keystroke recording, screenshot capture, and the tracking of some applications used and the recording of Internet activity. The software also supports multiple monitors. The more recent version of Elite Keylogger has been tweaked to more effectively avoid detection. Thanks for the review. I tried several keyloggers from the list and indeed they were all good. I ended up purchasing Argos Monitoring which is apparently the most intuitive and hidden. Almost all free keyloggers on the Internet have virus or Trojan horse, and I don’t know of any free Keyloggers that are actually free…most of them are a trial, allowing you to use the software for up to 30 days until you have to actually buy it. Maybe you should try a free trial…you might like it enough to actually pay for it. I have used Anykeylogger (http://www.anykeylogger.com), it’s easy to use and works well, what’s more, its price is reasonable.